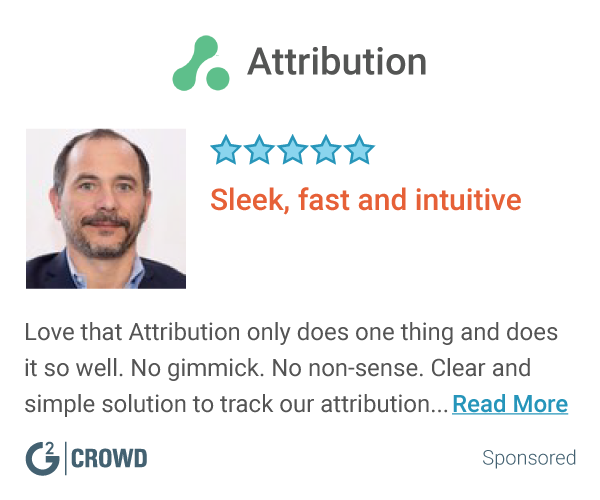 "Great Platform For Reviewing Marketing Data In One Place"
If you aren't able to pay for Attribution 360, then this is a great and free option. It takes off the workload by allowing us to view all our marketing data in one place and makes it easy to improve our marketing efforts by providing us with insights for greater returns. It tells you exactly what ads that consumers are clicking on and allows to evaluate what's working for us and what can can be improved. The information that Attribution provides is more in-depth than the similar service provided in AdWords which was a factor in deciding to purchase a subscription. Depending on how much traffic your ads are generating, there may not be enough data to create a Attribution model at first, which was the case for our company. I recommend this for small and some large businesses that have invested in marketing and want to evaluate its impact and be provided with feedback. We can now see what ads are really reaching our target audience thus improving our marketing efforts and promoting business growth. What I like most about this tool is that it allows me to integrate in a very simple way all the data obtained through other marketing tools, thanks to this interaction it can make possible the decision making in an optimal and efficient way which translates in the good decision making when trying to execute projects! The most complex to use this tool is to have very clear objectives that can be used, this is something that can be used as a tool and this becomes a disappearance, since ultimately you must train to use this program. It is an excellent tool that is practically revolutionized digital marketing, I like it because it allows to integrate in a very simple way the other previous databases which constitutes a great advantage for the moment of carrying out market studies and in turn implementing policies according to the demands , the experience with this tool has been very useful for me. I have improved my studies on some very specific aspects and in this sense this tool has helped me to make the best decisions. This tool has turned out to be very useful because it has allowed us to integrate in a very easy and simple way all the results obtained during long years of work! Google Attribution was the best program I found for integrated analytics and condensing all my info to one program and place. I truthfully can't think of anything right now. I use a lot of google programs and they all seem to run seamlessly together. Make sure to follow tutorials and watch video's so that you can get the most out of the program. There is a lot that this program can do and it is easy to miss some of the functionality if you do not know what you are fully doing. Google Attribution allows us to make sure we are making all the right decisions to get the best results for our business. Flexible Data integration and also makes marketing any products very easy. helps to know the accurate data for enhancing the performance. the dashboard and the features can be more some cumbersome. And sometime it takes more time to do works hence have to wait for the data outputs. Helps to optimize the market and true value of the market can known easily through it. It is a pretty decent product and it does its job just perfectly., what i like about it is that it is exactly that tool which helps to measure and optimize your marketing spend within different channels ., it brings all your marketing data in one place and provides complete view of your performance and insights, also helps to optimize your strategy, . Analysis of digital marketing responses, marketing analytics, data attribution., just in general was trying to get the idea how to make marketi More effective and results oriented. Google Attribution will allow you to unify and analyze the data flows available. You can see the performance of your campaigns as a whole and help you get information faster, since it simplifies the import of your data. "Easy to use and great results"
I like how it collects data from multiple sources and presents it in an easy to read format so that even people not versed in marketing and data collection can understand it. I dislike the fact that we can't have a large number of users for it. I can't create a login for any board member to go in and view themselves because we are limited to a specific number of people who can access it. We have paid for marketing and didn't know what was effective for us or not. Google attribution analyzes all the data for our company and basically let's us know where our money is best spent. There were no particular issues. It was a slightly steep learning curve. "Using Google for almost all internet activity"
There was a learning curve at the beginning. I've seen areas where I have spent far too much and corrected it. The add one and marketing. Also the fact that it tracks your online activity. I liked the best was it how the UI works! I am able to know the market trends and demands of people. * We monitor all Google Attribution reviews to prevent fraudulent reviews and keep review quality high. We do not post reviews by company employees or direct competitors. Validated reviews require the user to submit a screenshot of the product containing their user ID, in order to verify a user is an actual user of the product. Hi there! Are you looking to implement a solution like Google Attribution?